Biryani is perhaps one of those dishes that has been quite popular across India. Of course, there are multiple varieties of the dish with regional flavor thrown in. The Dum Biryani is one of the varieties that has gone popular and preferred by most of the food connoisseurs. But, what if you are looking to cook Dum Biryani at home? We will check out the top 5 best Dum Biryani Cooking vessels that are available to buy online in India. Let us check out the best options available to you. 3 Conclusion on Best Heavy Bottom Dum Biryani Cookware in India. Like with any other product, you need to pay close attention to the finest points that the product offers you. What should you look for in your new Dum Biryani cooking vessel? This buying guide should help you achieve the best results. The material used for the Dum biryani pot should be such that it spreads the heat evenly. This will help achieve even cooking. Thick base and sides, or often known as heavy bottom cookware’s will ensure that the layers of the biryani are cooked in an even manner and avoid half cooked meals. This should be something that depends on your family size and the purpose of buying the Dum biryani cooking pot. If you have been throwing parties frequently, you will need a larger size. A family of four should ideally need a cooking vessel of medium size or around 5 litres capacity. The cleaning of the vessel needs to be trouble free. Given the fact that biryani cooking involves a lot of ghee, oils or other similar items, dishwasher compatibility can be a desired factor. A non-staining material will translate into the best functionality from the cleaning point of view. A biryani vessel used only for biryani may not be something you would look ahead to. It may be advisable to go with the product that offers you multiple use options with a focus on the Dum biryani cooking. A pot with both cooking and serving features can be added advantage and reduce the extra task of transferring the cooked content into a serving vessel. The Biryani cooking vessel you buy should have almost all the features that will ease your cooking to a greater extent. One of the features we would look forward is the cooktop compatibility. A good vessel should work with both induction cooktop and the conventional gas stoves. The handle should be easy to handle and long enough not to burn your hands while handling. Having understood how to choose the Biryani cookware which suits you the best, let us now move ahead to find the best Biryani cookware available online in India. Futura Hard Anodised Cook-n-Serve Bowls from Hawkins is indeed the prime option for the best Dum Biryani Cooking vessel by any standard. In fact, it can be an ideal choice for both Indian and Western dishes alike. The vessel serves as the best cook and serves bowl and easily cleanable. The 4 mm thick base and sides should be helpful in an even cooking experience. It can retain the heat for a considerably longer time and thus should be best for both cooking and serving. High-end durability, thanks to the hard anodized finish. It comes with a recipe booklet with over 12 tested recipes. The aesthetic look enhances the look on your dining table. Nontoxic and non-staining material would be the best both for health and taste. No major cons that can be considered. Q: Is it compatible in induction cooktop and dishwasher? Q: How much rice can I cook on it? A: The six litres capacity vessel should be enough for 1 KG rice. The Pigeon by Stovekraft Non-Stick Biriyani Pot features the world-class nonstick coating and ensures stain free performance for your Dum Biryani bouts. The superior finish is what should give your kitchen a new look. The handles remain cool no matter what you are cooking. This can make handling them easier. It comes with a spiral bottom and metal ladle friendly construction. 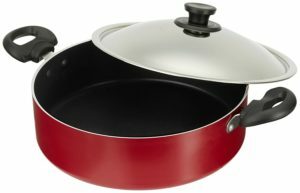 The cookware is manufactured using the PFOA Aluminium. It is dishwasher friendly and easy to clean. The spiral bottom ensures that it cooks with an equal distribution of heat. You can expect faster cooking with the spiral bottom. The 3mm thick thermacore base is toxic free and keeps your food safe. No support for the Induction cooktop. Q: What material is used for coating? A: It has the coating by triple layered scratch-resistant Greblon. Q: Can we cook gravy items on this cooking vessel? A: Yes, you can cook curries and gravies. 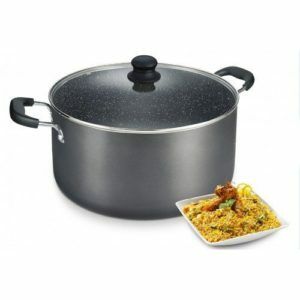 The Pigeon Non-Stick Biriyani Pot with Lid is an excellent option for most of your needs in terms of cooking biryani. Quite different from the above Pigeon biryani vessel described above, it is compatible with the Induction cooktop. The material of construction is PFOA Aluminium and offers you a toxic-free functionality. The cooktop is metal spoon friendly and offers you sturdy and cool bakelite handles. It comes with the trademark spiral bottom as well for enhanced performance. 3mm thick body with spiral bottom ensures streamlined and equal cooking. The coating is provided by the triple layered scratch resistant greblon. The cooking vessel is an excellent option for toxic free. A little big for nuclear families of 3 members. A: Yes, it is dishwasher safe. Q: What is the quantity of rice that can be cooked on this product? A: You should be able to cook up to 3 to 4 KG’s rice. 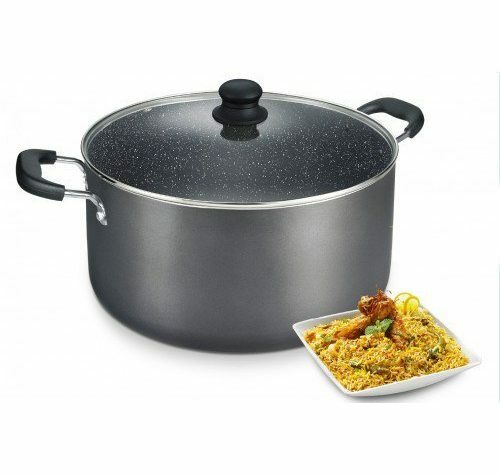 The Prestige Aluminium Biryani Pot should be an excellent choice for your needs if you are looking for the Dum biryani cooking vessel for a huge family. 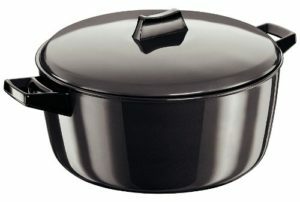 The 21-litre capacity Biryani pot is best suited for both cooking and serving. The PFOA free non-stick construction makes it one of the prominent choices for your needs in toxic free cooking. Dishwasher compatibility is yet another feature that makes it a great choice. You have access to a long life durable coating that stays on for years together. Cleaning should not be a concern with the non-staining surface and dishwasher friendly. Two layers metallic construction enhances the durability of the product. The best option for hosting a party. Can be too big for the smaller families. Q: Does it work with an Induction cooktop? A: Yes, it works with the induction cooktop. Q: Can it be used for deep frying? A: Yes, it can be used for deep frying and making curries. 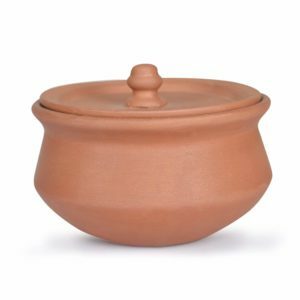 The StyleMyWay Handcrafted Clay Cooking/Serving Biryani Handi/Sauce Pot with Lid is an excellent option if you are looking for an option to cook tasty food in a more traditional Indian manner. This should be the best cooking mud pots available online for handling your cooking in the healthiest ever manner. Get rid of all metals, chemicals, and toxins and enjoy healthy food every day with the clay pot cooking. It should be one of the easy to use cooking option and cleanest cooking tool. Built for everyday use, it can bring a new aesthetic to your kitchen. Natural and toxic free method of cooking. Safe to use with a microwave. Each of the order is made personally on a potter’s wheel and thus stands proof to human intellect. The material is fragile. Ensure care while using. Cannot be used in a dishwasher. Q: Can it be used on an induction cooktop? A: Yes, it works on the conventional gas stove, induction cooktop or even on an electric stove. Q: What is the size of the cookware? A: The cookware measures 500 ml. But, size and shape may vary slightly as each item is made manually on a potters’ wheel. 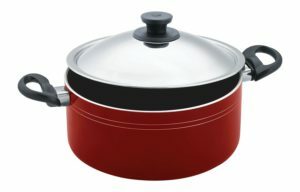 Conclusion on Best Heavy Bottom Dum Biryani Cookware in India. Enjoying a delicacy is one thing while preparing it is another. If you are looking for the best utensils that can help you cook the best ever Dum Biryani, the list we have compiled here should help you as a reference. Have you used any of the products featured here? Do share your experiences with those products with us.